An actinic keratosis (also known as a solar keratosis) is the most common skin condition caused by sun damage. It is the result of skin being damaged by the sun over many years. 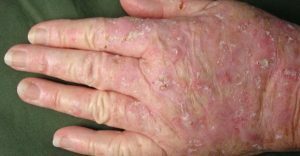 Actinic keratoses are usually rough, scaly patches on sun-exposed areas such as the head and face. They are common, especially in older people, many of whom have more than one. Usually they are harmless but there is a small risk that they may eventually turn into skin cancer. So, treatment is usually advised. These are commonly known as sunspots and are small raised scaly lesions typically occurring in clusters and are significant in that they denote UV damage in the individual. 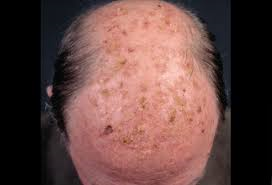 They commonly occur in exposed areas and a small percentage transform to SCC. They can be treated with topicals as well as cryotherapy.